When it comes to removing makeup, cleansing, toning and then moisturising, you have to use a whole bunch of products and it takes a whole lot of time. But does that need to be the case? Wouldn't it just be so much easier to do it all in one go? Well, that's where today's product comes in. 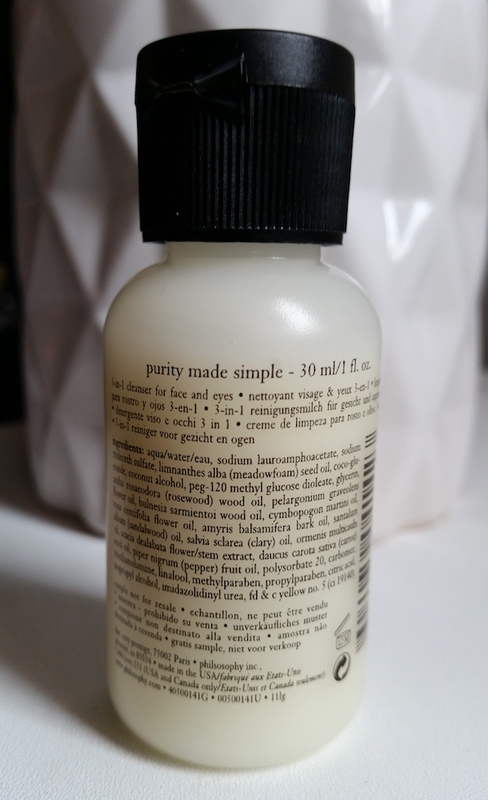 Philosophy's award-winning Purity Made Simple Cleanser is a 3-in-1. It helps to remove makeup, cleanse the skin and also tone. In one step. On top of that, it also helps to lightly hydrate the skin. It promises to penetrate deep into the pores to remove dirt and its natural oils help to keep the skin conditioned. It is also suitable for use in the eye area AND is gentle enough for sensitive skin. Sounds great, am I right!? This is a cleanser that I have heard a lot of things about, so trying and reviewing it had to happen. I'm just surprised it has taken me this long. It comes packaged in a clear bottle that comes in a range of sizes, but the one that I have here in the photos is a smaller 30ml bottle. The cleanser itself is a pale yellow in colour and is a nice creamy consistency that isn't too thin or too thick. To use, you need to apply a 20p size amount onto a slightly damp face and massage in for 30-60 seconds, rinse and then pat dry. The first thing I noticed with Philosophy's Purity is that it spreads across the skin well. When it comes to cleansers like this, a 20p size amount may not be enough, but with this one I find that it is. As you use it, you can see your makeup melting away, and when you rinse (or wipe away with a face cloth), it all just disappears. You don't even need a second go. This works on stubborn waterproof mascara too, so you can use it to remove all areas of makeup. On the cleansing side, this cleanser leaves your skin feeling super smooth and glowing. With continued use, you can also see improvements with skin tone and your skin looks much brighter. Some cleansers or makeup removers can really irritate my eyes when I use them, but this one doesn't effect them at all. When they say gentle and non-irritating, they do mean it, so if this is a concern to you then you should be okay with this. It doesn't leave the skin feeling dry or tight which is fab, but even though it is lightly hydrating, you will need to follow up with a moisturiser. Overall, I'm loving this cleanser. It is certainly no secret that I love a multitasking product (and if you're a regular reader of the blog then you're probably sick of me harping on about that fact), and this one fits the bill perfectly. 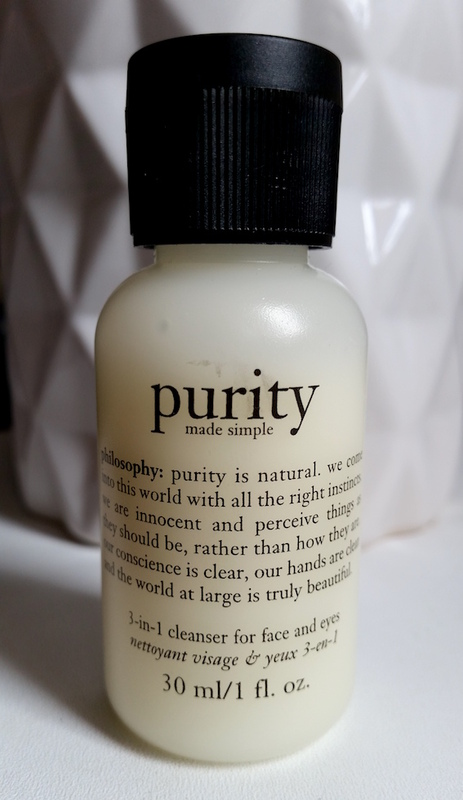 Philosophy's Purity is one of those cleansers that I think deserve the hype. It's probably better off for evening times due to the massage time and it's ability to help remove makeup properly, but it is suitable for use in the mornings too. If you're looking to streamline your routine though, you should definitely give this a shot. 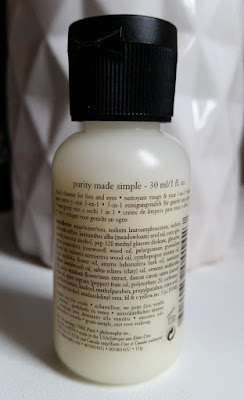 You can purchase Philosophy's Purity Made Simple Cleanser from Boots. What are your thoughts on the Philosophy Purity Made Simple Cleanser? What are your favourite makeup removers, cleansers and toners?